An Alan O’Sullivan tap-in on the brink of half time was enough for DCU’s senior soccer side to see off UCD in Tuesday’s season opener at St Clare’s. It was a very welcome win for DCU over a side that traditionally they would struggle against. Despite a poor season last year that resulted in an early Collingwood Cup exit, UCD are always one of the stronger sides in college soccer so taking three points from them is certainly a bonus. It is a feature of college soccer, and indeed all college team sports, that a certain amount of rebuilding has to take place each year with players leaving and new players coming in. DCU have been lucky enough this season in that not too many players have left and there has been an influx of new talent. Eight of the DCU starting eleven were a part of the team that reached last season’s Collingwood Cup semi-final, something that will have pleased coach Declan Roche. The home side started the stronger with early joy coming down the right wing thanks to the pace of Michael Isichei. It would be Isichei to whom the first real chance of the game fell when a well-taken corner from Darren Craven found the winger at the back post but his mistimed header bounced wide of the post. UCD were under the cosh and struggled to create anything in the opening 20 minutes are so as DCU attacked at pace. The home side should have taken the lead on 18 minutes when Philip Kavanagh’s jinking run down the right wing allowed him to find O’Sullivan on the penalty spot but his effort was well saved by Niall Corbet before Isichei’s follow up strike the outside of the post and was scrambled away for a corner. The next 20 minutes saw the game go somewhat flat as both sides struggled to create chances. DCU captain Robert Gaul impressed in breaking up the UCD play as he excelled in the holding role between defence and midfield. It was Gaul’s Shelbourne team mate who put the Glasnevin side into the lead on the stroke of half-time after some excellent build up play that began with centre back Tom Lahiff. After picking up the ball in defence Lahiff played a perfectly weighted pass through the midfield to Isichei on the right. 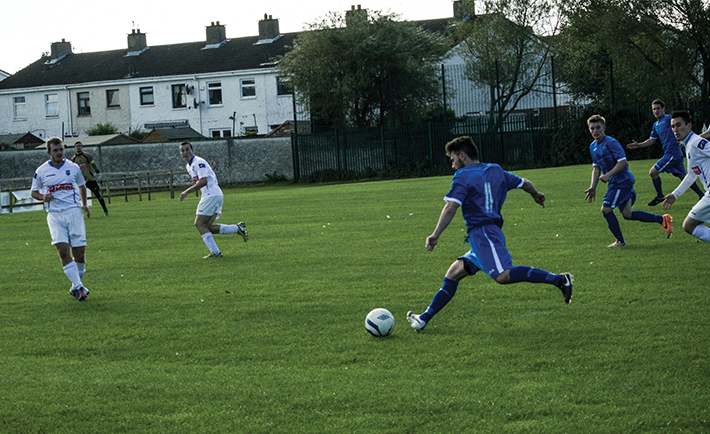 The winger cut inside and rolled the ball across goal allowing O’Sullivan to tap in to an empty net. The former Aberdeen striker almost bagged himself a second minutes later with an impressive solo effort. Picking up the ball on the halfway line he turned sharply and ran at the UCD defence before unleashing a powerful drive from 25 yards that had Corbet beaten but came crashing back off the crossbar. The goal had come at a perfect time, allowing DCU to go into the break on the ascendancy. Indeed the home side came out the stronger in the second period, David Gaul’s shot almost seeing the lead doubled only for a good save from Corbet. UCD were always going to fight back however and as the clock ticked on they began to press in search of an equaliser. On the 66th minute a good chance went begging when Tyrone McNorris’s free-kick into the box was bundled wide by Conor Cannon. With 20 minutes to go the visitors made a treble substitution as they looked for an equaliser. The move nearly paid off when Brendan Martin and Gareth Coughlan combined well but Coughlan’s effort flew over the crossbar. DCU were defending well and almost netted a second on the counter attack when Jack Memery ran the length of the pitch with the ball before shooting narrowly wide. The home side managed to hold out for the victory but not without thanks to goalkeeper David Flaherty who made an excellent save from Tom O’Halloran’s free-kick in the dying minutes. DCU: David Flaherty; Philip Kavanagh, Tom Lahiff, Jack Memery, Shane McCann; Michael Isichei, Robert Gaul, Darren Craven, Mark Walshe, David Gaul; Alan O’Sullivan (Dean Gregan, 84.). UCD: Niall Corbet; Ciarán Quinn, Stephen Byrne, Ryan McLaughlin, Sean Coyne; Tyrone McNorris, Timmy Molloy, Niall Hanley, Cormac Suor; Conor Cannon, Tom O’Halloran.